Sadly, ourÂ time in Iran is coming to an end and the kindness and generosity of the people is certainly reflected in the size and weight of our bags. “I think we have just packed around 30kg of presents,” Gerlinde said lifting her heavy bag off the scales. “But the greatÂ thing is that all the giftsÂ are very beautiful.” We have just packed, and as weÂ are about to go to the airport, I would just like to give you a brief recap of our 10 days in Iran. Once I am back in Europe I will certainly send more informationÂ through. AfterÂ having spent three days in Tehran attending some meetings, doing interviews with Iranian media and going for energising morning runs in a park featuring aÂ beautiful backdrop of the mountains, we were takenÂ onÂ a trip down south by Pary, her husband Arman, and some kind friends – Kian, his father Qu and Sahan -Â whoÂ treated us to this experience. 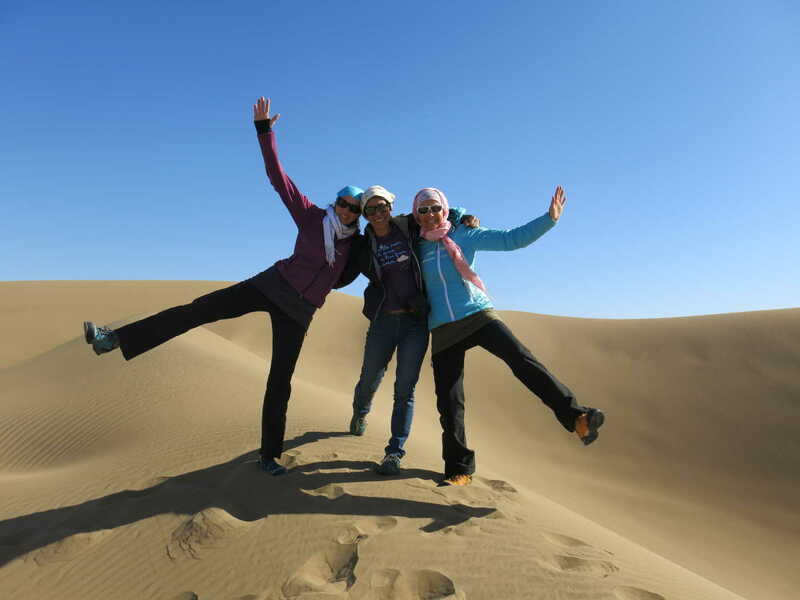 We visited the two ancient cities of Kashan and IshfahanÂ as well as went onÂ a day trip to the stunning Maranjab Desert. “You are our guests and we are so proud to show us our country,” said Kian, the entertainingÂ desert expert, who showed us that nature has other beautiful places in store than just the mountains. 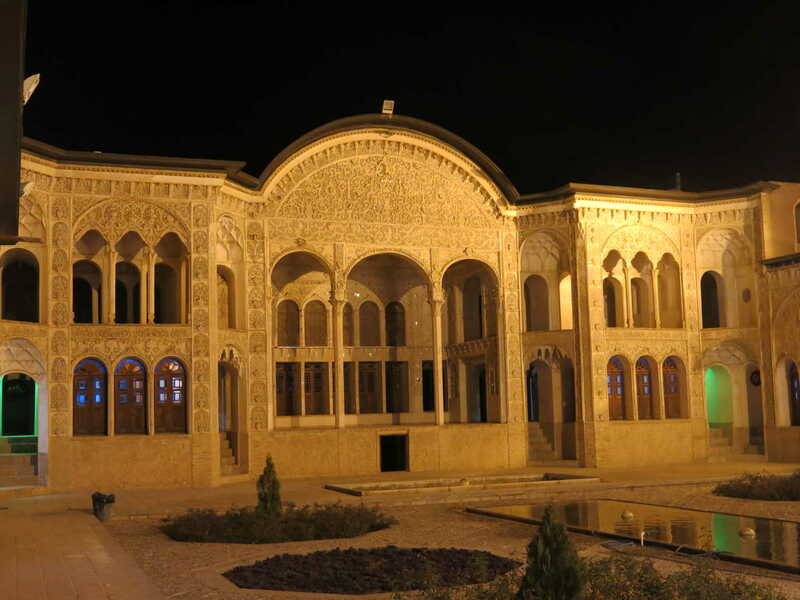 Both Kashan and Ishfahan were very impressive townsÂ and even though neither Gerlinde nor I are city people we enjoyed the palaces, mosques and old manor houses very much. Our desert trip, however, was something very special for both of us and we were fascinated by Kian’s driving skills as he negotiated the steep dunes very easily. “Don’t be scared – I won’t do anything dangerous,” Kian said when he saw us look ratherÂ worried when heÂ embarked on the first precipitousÂ downhill. However, it did not take long and we all enjoyed the ride, which reminded us of being on a roller coaster. After about an hour driving through the dunes, we stopped and got the chance to play around in the sand. “This would be fantastic for skiing,” said Gerlinde breaking out into a run while Pary and Arman decided to take the desert experience to the extreme and rolled down the hill like two Bavarian sausages. After having had a healthy mealÂ of fresh fruit, vegetables and some delicious Iranian bread between the dunes, we watched a gorgeousÂ sunset and embarked on ourÂ trip back to Kashan. At this point, we would both like to thank Pary, Arman, Kian, Qu and Sahan for their generosity to treatÂ us to this trip to Kashan and Isfahan. It has been a wonderful experience! Our schedule was once again full when we returned to Iran’s capital city and we had the pleasure to meet more people, one of which wasÂ the professional female ice climber,Â Zohreh Abdollahkhani, who represented Iran at the ice climbing competition in Sochi during the 2014 Winter Olympics. “I am so honoured to meet you,” she kept on telling us. But it was for us to feel privileged, especially after we had watched Zoreh and her three female peersÂ dry tooling in a little yard hidden away behind the building of the Tehran Climbing Association, where we had just done another interview. “It’s soÂ interesting to see the power of these women behind these walls,” we both agreed feeling almost dizzy looking at Zoreh skillfully dry tooling her way up the 10m-high wall. The next highlight of the trip was the hike up to Tochal, a 3,960m-high mountain on the outskirts of Tehran. “It’s my training mountain and I am so happyÂ that we can go there together,” Pary said excitedly despite the gloomy weather forecast. “It’s better to take warm clothes as Tochal can be very cold,” she continued pointing at theÂ little frostbite on her cheek, which she got a week earlier. Pary told us that she really appreciates having an almost 4,000m high mountain on her doorstep as it is great high altitude training. Wouldn’t we love to have something like this in our backyard :-). After we had driven for about half an hour, we started our hike at 1,800m. The path took us through a few tiny villages before it veered steeply off to the left, where we scrambled up for another hour to reach the Shipala hut, where a friendly hut warden welcomed us and made us breakfast. “He is very happy to have usÂ as life in the hut up here can be a bit lonely,” said Pary pointing out that hikers usually come on a weekend, which falls on a Thursday and Friday here. 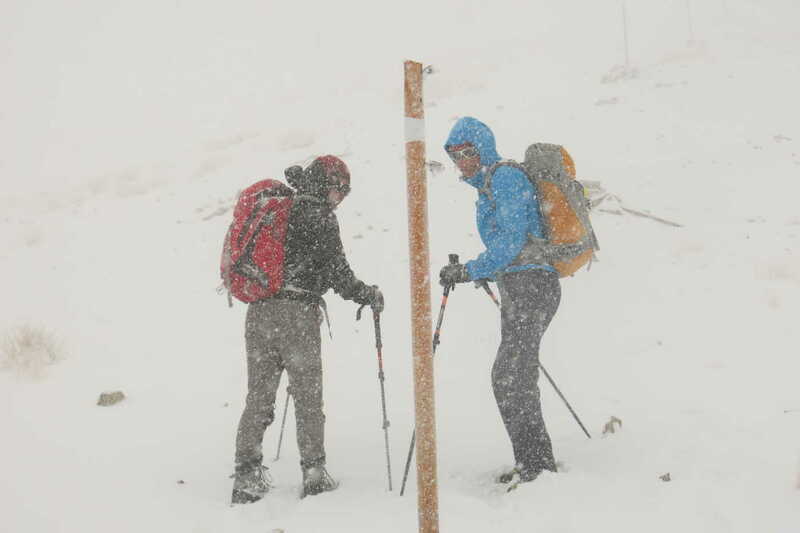 Once we got going again, the wind picked up and it started to snow and by the time we reached the summit, we were glad to find a shelter up there as we would not have managed to thaw our fingers and faces without it. 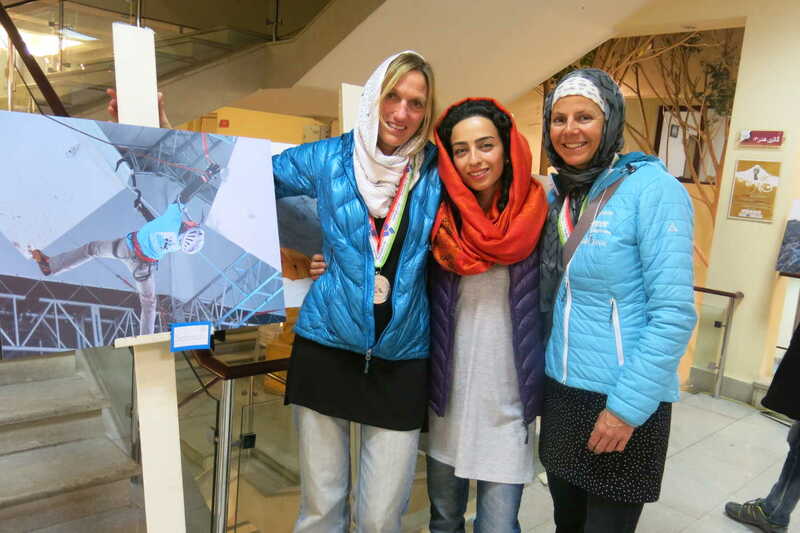 “I guess it must be around -20 C with the wind chill,” said Pary trying to warm her hands on the little stove of three young Iranian climbers, who had joined us on the way up. However, when we started heading down again the weather gods wereÂ kind to us asÂ the skies opened offering a stunning view of Tehran. “It is incredible thatÂ we have just been so exposed to the elements up here and Tehran is just a stone throw away,” said Gerlinde. After having spent the whole day outside, we had worked up a good appetite, which was rather appropriate as we had a ‘small’ dinner party to attend. “There won’t be too many people,” said Maryam, one of the organisers of the photo exhibition, when she picked us up. “Only about 50 people.” However, it was fabulous to see most of the people involved in the exhibition again and get to say goodbye to them. Ooops, even though this was supposed to be a short post, it has actually become quite long, however, it is only just scratching the surface about our time here. But before coming to an end, we would like to thank the wonderful and kind people ofÂ Iran, who made our time here so special. First and foremost, we would like to thank our friend Parvaneh and her husband Arman for their hospitality, the good and healthy food, the entertainingÂ evenings, the chauffeuring around, the borrowed clothes and head scarves, the opportunity to meet people and the love and care they gave us over the past ten days. One of the most overwhelming things was also to see around 10 people at 3am at the airport – just to say a quick goodbye to us. Thank you! As it is very difficult to list everyone, who has welcomed us to this country with open arms and has overwhelmed us with kindness, generosity and of course 30kg of presents, we would like to express our gratefulness toÂ everyone for enabling us to see and experience so much of Iran. It has been a very special experience and we both hope that we were able to inspire some people and we hope that the women of Iran will keep up their wonderful spirit and continue to strive to fulfillÂ their dreams! Thanks a lot my dears Billi and Gerlinde for sharing your few days with us, inspiring people specially women and teaching us a lot not only about mountain but also humanity! We are waiting to see you both again in Iran! Thanks for your coming in Iran. Its an exclusive memorial in my age and a glory in my life. I’m as many people here waiting to see you soon in Iran. Viaggiare, Ã¨ in assoluto, la cosa piÃ¹ bella che un individuo possa fare nell’arco della sua vita. I’m happy that you enjoyed these days even though unfortunately your trip time was very very short and time ran… for the next time we do lot of other interesting activities here including climbing our highest Damavand.